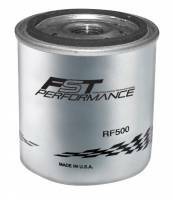 Filter Solution Technologies (FST) Performance manufactures high performance fuel filters specialized for racing. Offered in both in-line and canister styles, FST filters are designed to separate water from fuel to ensure that only fuel is going into your engine. Manufacturers of Ultra High Performance "FUEL" Filtration for all fuels in Automotive - Marine - Ag-Eco - Racing - Performance. Gasoline, ethanol, methanol, diesel, vegetable-oil & bio-diesel and all racing fuels. 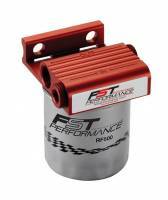 Fuel Filtering & Filters: Why FST ? 1. Filtering; In the past, because you could get away with poor fuel filtering when running a carburetor, all you needed was flow. So, performance fuel filters were kept small and "opened-up", thus sacrificing filtering efficience to get fuel flow by using high micron rated media (filter elements) because they had a small filter surface area. A good one "might" provide 10 microns of filtering efficiency with 60 sq. in. of surface area. 2. Water / Ethanol; Also in prior years, ethanol and water in the fuel was not as prevalent as it is today. Even some high-octane, high performance and racing fuels are having water and ethanol contamination problems. (Competitors') stainless steel screen filters do nothing to stop water and older paper filters would swell up if you ran ethanol, alcohol or methanol because they were water blocking (would absorb water) not shed it. 1. Filtering; FST uses a much larger surface area media (filter elements). Even our smallest filter has 122 sq. in. of media and our largest has 579 sq. in.! With this larger surface area, FST uses two different micron rated filter medias: 4 micron in our smaller RF500 & RF700 filters, and 3 micron FloMax? filtering media in our larger RF500M & RF900D filters. As a result FST can filter down to 3 or 4 microns of contamination (2.5 to 3.3 times better than the competitors) and still flow 300-350 gph! 2. Water / Ethanol; The FST FloMax? 3 & 4 micron filtering media mentioned above also separates and sheds any and all water on contact with the filter media. No, it can't separate the ethanol, but ethanol attracts water so a water separating filter media is a must to optimize filtering efficieny. Older water "blocking" filter media would swell up and block fuel flow, not FloMax?, it sheds, not blocks! 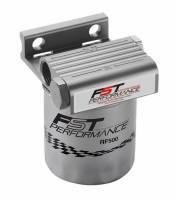 With today's high-performance fuel injection, FST fuel filters are the answer to the problem of improper injector operation and efficiency. Another problem (and FST solution) pertains to diesel fuel during engine operation in cold weather. All of the same problems (and solutions) discussed above hold true with diesel. In addition, one more problem exist in cold climates. Even during operation of the vehicle (driving), cold fuel can gell or wax (cover the surface of the filter element), sometimes even stopping fuel flow and preventing operation of the engine. Solution: FST's TurboFyner? fuel refining filter system (#RPM900) filters down to 3 micron, separates water and heats the fuel while driving. Go to the "Filter Systems" tab above and click on "RPM900" for complete information about this revolutionary fuel filtering system that is especially a must when using bio-diesel or vegetable oil fuels. With all of the changes in today's fuel(s) and fuel injection, the one thing that is more important than ever before, and has been the one missing piece in the street-performance & racing markets, is a fuel filter that really filters the fuel and separates water, yet with the flow needed for today's performance/racing engines. Most of our fuel filter competitors compromise filtration for flow. Due to the large square inch capacity of media, FST's FloMax? maximum flow (300-350 GPH) and highly efficient 4 and 3 micron filtration and water separation make the FST line the most innovative and efficient system ever developed. Stainless steel screen fuel filters (like most competitors) do nothing to shed/stop water and may only filter down to 10 micron. In fact, several fuel injector manufacturers & rebuilders use FST 3 micron fuel filters on their equipment because of FloMax? efficiency and flow rates. We do not build carburetors, fuel injection systems or fuel pumps We just build the most efficient high performance FUEL FILTERS available. FST = "Takes the CRAP out of your fuel"? All housings are manufactured from solid billet 6061-T6 aluminum - absolutely no castings - and are lightweight and extremely compact for use in gasoline, racing fuels, ethanol, and methanol applications with the FloMax? systems and diesel & bio-diesel with the TurboFyner? system. The easily replaceable spin-on filters are totally self-contained, requiring no messy and questionable canister cleaning, eliminates cartridge style filter back-flushing and totally eliminates any chance of fuel system contamination. With the spin-on style filter sealing system, there are no housing seals or gaskets to dig out and no gaskets, o-rings or seals to leak or swell. Our FloMax? filter media separates and strips water to settle in the quite zone of the filter, not blocking the filtering media as some water-blocking competitors do. The FST Performance product range includes Filter Solutions Technologies, LLC, FST Performance, FST Performance RPM300 Fuel Filter System, FST Performance RPM 350 Fuel Filter System, FST Performance RPM500 Fuel Filter System, FST Performance RPM700 Cartridge Fuel Filter System, FST Performance RPM900 TurboFyner Diesel Fuel Refiner and Filter System, FST Performance RPM900 TurboFyner On-Board Fuel Refining System, FST Performance Replacement Filters and more.